Local keyword research is often frustrating because the free Google Keyword Planner does not always show data for keyword terms with low search volume. This is often the case with local keyword terms—meaning those that contain geo-modifiers. Tip #1 – Just because the Google keyword planner does not return data for a local keyword term, does not mean people are not performing search queries using this term. In this report we can see the Google Keyword Planner shows the monthly search volume for refrigerator repair orange county ca is 70 and the monthly search volume for refrigerator repair irvine ca is 30. Looking at another appliance repair service, the Google Keyword Planner shows the monthly search volume for oven repair orange county is 30, but the Google Keyword Planner does not return any data for the keyword term oven repair irvine. Using logic obtained from observing relationships in keyword search data we can conclude that people are performing search queries for oven repair irvine, and this may be a satisfactory phrase to target. Tip #2 – If your keyword tool does not return any data with search terms containing geo-modifiers, check the search volume of the terms without geo modifiers. 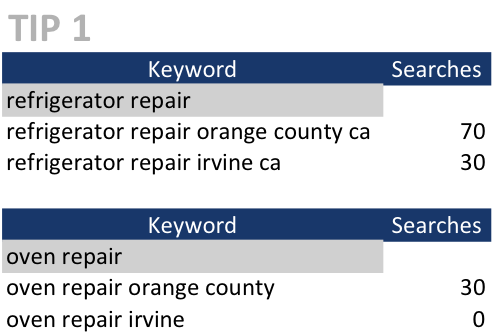 For example, analyzing a long-tail keyword derived from refrigerator repair we see that refrigerator repair service has a monthly search volume of 390 according to the Google Keyword Planner. However the looking at this keyword with a geo-modifier, refrigerator repair service orange county, we find that the Google Keyword Planner returns no data on monthly search volume. Using the same logic from tip #1, this and other long-tail derivative keyword may be satisfactory phrases to target with geo-modifiers. Tip #3 – More people in the United States of America perform search queries with geo-modifiers for states using the abbreviation than the full spelling. In the keyword report we can see the Google Keyword Planner shows the monthly search volume for lawyer orange county ca is 30 and the Google Keyword Planner does not return any data for lawyer orange county california. Throughout the course of your local keyword research you will find this is most often the case. Tip #4 – Also check the search volume for keyword terms using geo modifiers other than cities, counties, and states. In the keyword report we can see the Google Keyword Planner shows the monthly search volume for lawyer san francisco is 110, but the keyword lawyer bay area also has a monthly search volume of 20. Remember, keyword research is crucial part of the foundation for a successful search engine marketing campaign because target the wrong keyword terms can quickly waste your budget. Improper keyword research is the same as prospectors putting time and money into a mine that does not contain a vain of gold—there will be little return on investment. Thank you for learning my 4 tips on how to do local keyword research. Frequently check back at my website for more informative content.